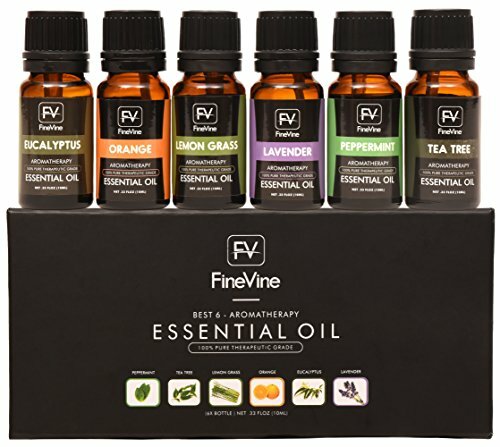 FineVine Organics Essential Oil Gift Set Made from the aromatic essences of plants, FineVine Organics 100% pure essential oil sets give off lovely scent and improve surround air quality. 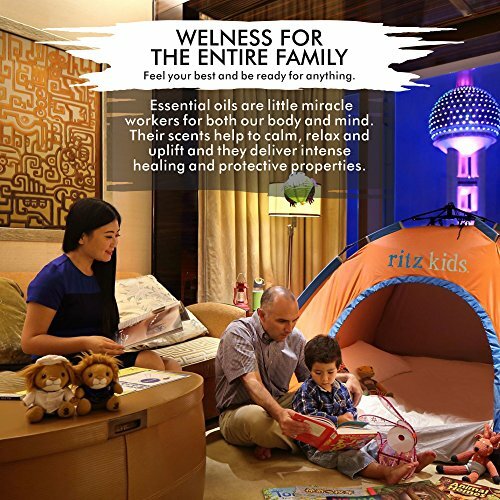 Each of the 10 ml bottles of essential oil provides natural therapeutic benefits for skin and home. Use a few drops in a diffuser to relax, mix with massage oil or beauty products to receive the therapeutics benefits. Our steam distilled and cold pressed oils are 100% natural, paraben free and perfect for both beginners and essential oil enthusiasts SOME OVERVIEW BENIFITS OF OUR 6 AMAZING SCENTS: Lavender Essential Oil - Lavender oil is known for its skin healing properties and its use as a sedative and aromatic. 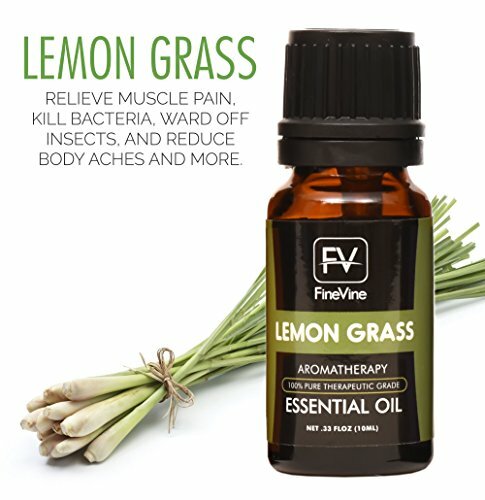 Tea Tree Essential Oil - is well-known for its powerful antiseptic properties and ability to treat wounds and more Lemongrass Essential Oil - is used as aromatherapy to relieve muscle pain, kill bacteria, ward off insects, and reduce body aches and more. 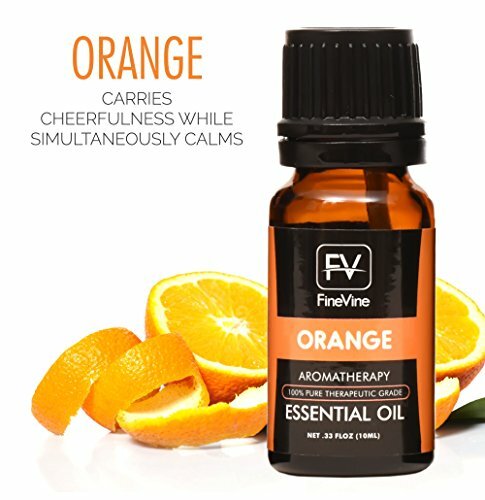 Eucalyptus Essential Oil - is excellent for congestion, sinus, skin, hair, arthritis, muscle pain, household scent & more Sweet Orange Essential Oil - Well known for its uplifting and worry-reducing properties, orange oil carries cheerfulness while simultaneously calms, making it ideal as an overall mood enhancer and relaxant. 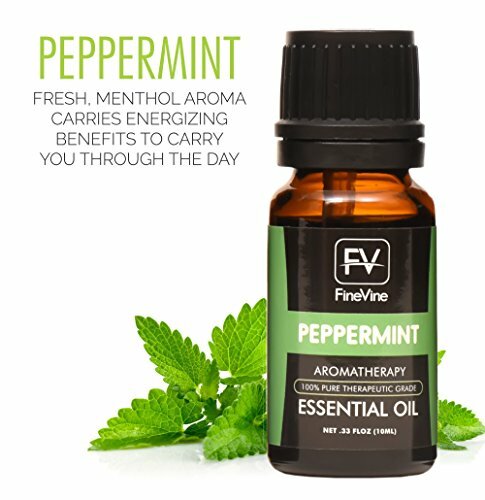 Peppermint Essential Oil - Its fresh, menthol aroma carries energizing benefits to carry you through the day - perfect scented carrier oil. 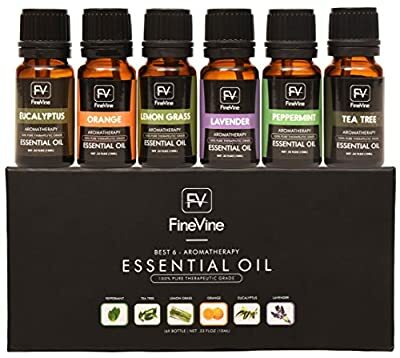 FineVine Organic Aromatherapy Essential oil starter set comes safelty sealed in a premium packaging with multiple scents making this a perfect gift for a bridal or baby shower, or anyone needing calming relaxation.